On Valentine’s Day, if you wish to show your beloved that your love will last forever, there is one gift that beats quickly-eaten (yet delicious) chocolates, transitory (although beautiful) roses, and the strangely-dependent-upon-some-group-you’ve-otherwise-never-heard-of “naming a star after them” that involves submitting paperwork to a theoretically international star registry. The ideal gift is a jellyfish. It turns out that once the adult form of the 4.5 mm-wide species Turritopsis dohrnii have reproduced, they don’t die but transform themselves back into their juvenile polyp state. Their tentacles retract, their bodies shrink, and they sink to the ocean floor and start the cycle all over again. Among laboratory samples, all the adult Turritopsis observed regularly undergo this change. And not just once: they can do it over and over again. 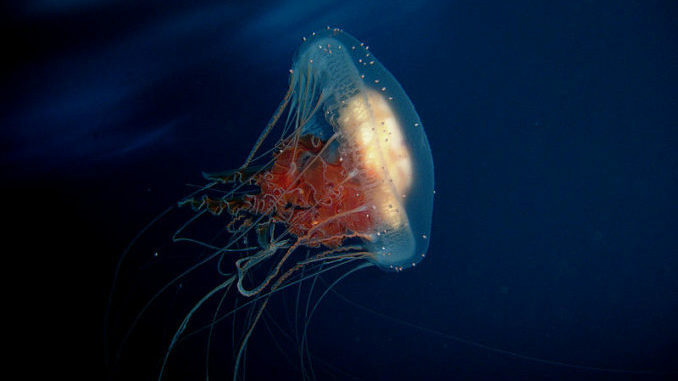 These jellyfish are still vulnerable to predators, to disease, and to violence. Barring those events, however, they are able to revert to their “childhood”, age to maturity, and return in a never-ending cycle. Of course, not everyone is happily paired off on Valentine’s day. People who were betrayed by an ex had an option this year to demonstrate their ire. The El Paso zoo allowed people to name an animal after former romances; the animal was a hissing cockroach. To cap the effect, the roaches are to be fed to the meerkats via a live streaming video feed on Valentine’s day. The fundraising effort was closed early due to greater-than-anticipated participation. And because nothing succeeds like success, we can expect to see other zoos throughout the world duplicate the offer next year around this time. So if you don’t want to have your namesake fed to a meerkat, consider a jellyfish gift this holiday. Or the chocolates, cards, flowers or simply a loving hug and an admission of how special your beloved is to you, through all of the turmoil and the joy. Your call. Question of the night: What’s your favorite truffle or filled chocolate treat?